New dental innovations have allowed our patients to instantly and painlessly have their own perfect smile. We have created thousands of winning smiles for our patients using the latest digital smile technology for fast and affordable solutions to restore or improve your teeth. Confidence boosting stunning dental aesthetic enhancements, from simple teeth whitening treatments to the best in complete smile makeovers. A variety of treatment options are available for different types of problems, needs and wants. We can also combine several of these options for you to give you, your smile to reflect your personality and the style of smile you prefer. Appointments are available in Hertfordshire and London. Download Brochure. Dr Rahul Doshi, the founder of The Perfect Smile Studios, has been voted as one of the TOP 50 most influential dentists in the country and awarded by his peers for his Outstanding Contribution to Cosmetic Dentistry. Below are the variety of problems that you may want improving and the options that may be suitable to help. 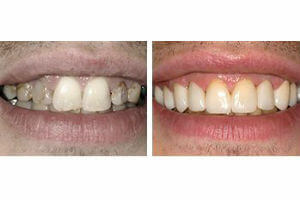 If your teeth are overcrowded or crooked then an inexpensive and effective procedure would be either braces or veneers. See Invisalign. Adult orthodontic solutions that only take six months to complete or brilliant smile makeovers using veneers can also give the appearance of straighter teeth within two visits to our dentist. Before & after. Improving your tooth colour: enhanced teeth whitening systems can be used to brighten your teeth. 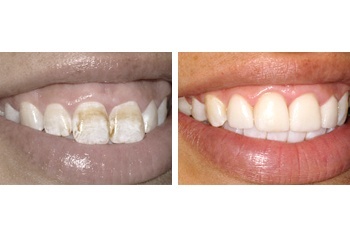 Mini-Makeovers use simple techniques to produce whiter smiles quickly and affordably. Alternatives are veneers. 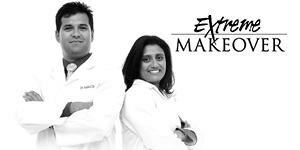 Enquire about our smile makeovers that create natural smiles whiter smiles in less time and cheaper than you think. The results can be amazing. Diastema procedures: There are dental treatments that can help to fix and remove the spaces between teeth and the gaps in your mouth to give you a better and more appealing smile. There are many choices closing or hiding gaps between teeth including veneers, dental bridgework, implants or invisible orthodontics. 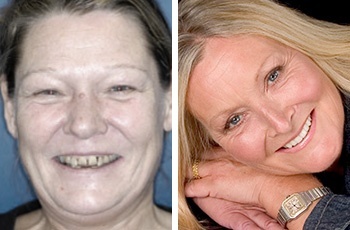 Poor shape, size and colour crowns are removed and replaced for a natural, healthy looking smile. Before & After. With practices and consulting rooms in London and Hertfordshire, we are dedicated to complete care dentistry that uses a combination of aesthetic dental disciplines to correct decayed or broken teeth. Sometimes due to the narrowness of the jawbone or missing teeth a smile can appear narrow. This leads to the widest part of the smile appearing darker and creating an increased focus on the front teeth with the back teeth not as visible. Our procedures are pain-free, straightforward and can improve patient's confidence by having a more attractive smile. Before and after photos. Attrition, Abrasion, Erosion: Multiple causes of unappealing worn teeth include an unbalanced bite, acidic food damage and / or teeth grinding. We can restore and improve the appearance of your worn or cracked teeth with strong, durable crowns or with veneers. We plan to prevent the causes of accelerated tooth structure loss and then re-establish the tissue. New Patients are often concerned if their teeth have an appearance of overbite, "underbite" or overjet. There a variety of simple overbite treatments options that can improve your smile. Bite adjustment can improve your quality of life as the shape of your face is being distorted by your malocclusion or bad bite. The Perfect Smile Studios offer the latest treatment options for gum recession, unattractive gummy smiles and uneven gumlines. 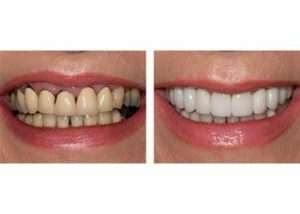 We use advanced lasers to improve discolouration and whiten gums as well as fitting bespoke gum veneers to reinvigorate your smile. We create all types of smiles to suit your personality, your look and your face. We use a variety of state of the art dental techniques to re-design your smile. Smile design is not just about changing your appearance it is a very useful way of avoiding dental problems in later life and an excellent way to ensure what every enhancement you make to your teeth, you receive the correct treatment and gain excellent results and value for money. 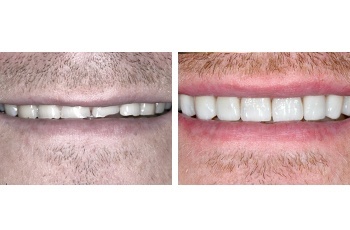 We can create predictable bespoke smile improvements that are unique and suitable for your face and your personality. See your new smile before we begin. This is a process that uses innovative digital technology to produce a new smile in accordance with how you imagine your eventual teeth to look like. We create the ultimate smile by designing and conceiving your new smile using all techniques and cutting edge technology not available in other practices. 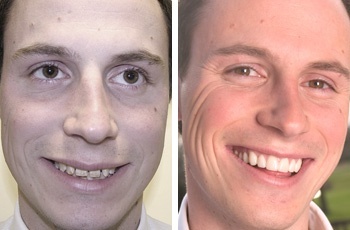 For patients who more minimal treatment is sufficient we offer a smile 'Mini-Makeover'. We also offer Other Simple Cosmetic Treatment Options to improve your smile. We can discuss the best option for you at a complimentary consultation and plan the treatment correctly after performing a comprehensive examination. We want you to understand the advantages and disadvantages of the variety of modern treatment modalities available before deciding on the course of treatment. Book your free comprehensive assessment or call us on 01992 552115 for more information.